Scritti Politti is a band from Leeds, England with very little ties to hip-hop except for this 12” we’re about to discuss. 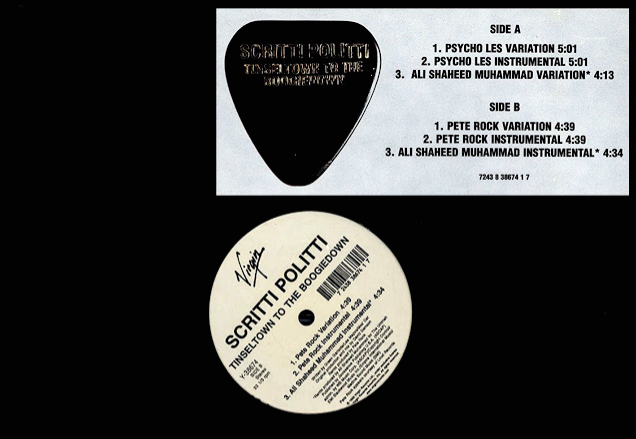 In 1999, Scritti Politti put out an album called ‘Anomie & Bonhomie,’ which off the strength wouldn’t get a glance from your average backpack fan, however, looking deeper you will see it includes a cut featuring Mos Def and Lee Majors of the underground crew, Da Bush Babees. A step further, the 12” includes 3 remixes/variations from legendary producers Pete Rock, Psycho Les, and Ali Shaheed Muhammad. With Mos Def & Lee Majors on all mixes, it comes down to which you like the most. I’ve always leaned towards Ali Shaheed’s variation, because it complements their style the most, but they are all solid. Band-member Green Gartside does vocals on the hook, in case you are wondering, and there’s a 4th variation by Rob Swift if you can dig up the double vinyl. Clever appropriation aside, this was a great record and should not be judged without first listening, so check out the full 12" below, and let me know which variation you dig the most.